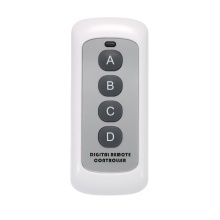 *The gadget is a wireless remote control key fob(transmitter), which comes with ultra-strong functions. *433MHz, learning Code(1527), transmit distance is 30-50m(Open space), bringing you new experience of remote control and much convenience in your daily life. *It supports remotely and wireless control your garage door, electronic gates, electrical appliances and other telecommand equipment. *Suitable for 433MHZ RF switches, and compatible with any SONOFF series RF 433MHz switches. You will never worry about that you will not open your garage door. *Light weight and compact size design, the code key is very easy and convenient for you to carry with when you go out.